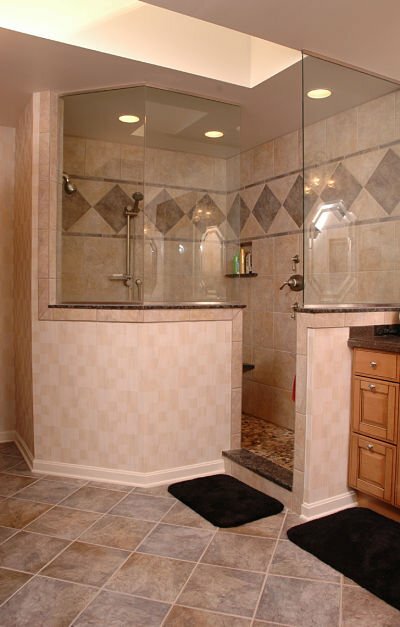 Homeowners are discovering the convenience, comfort, beauty and easy maintenance of walk-in showers without doors. 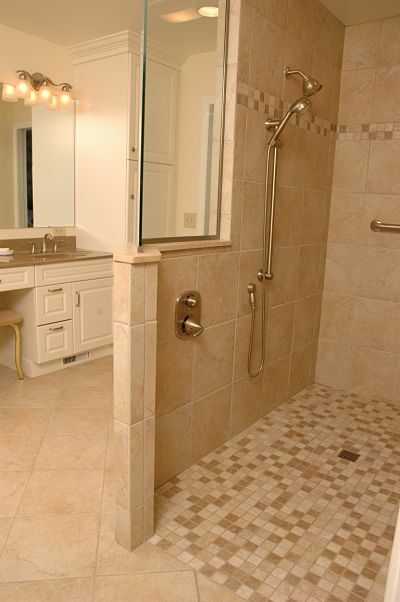 It’s no wonder that walk-in showers are now one of the hottest trends in bathroom remodeling. In this article you’ll find out why. When designing a walk-in shower without a door, there are many things to consider. First and foremost are the needs, tastes and budget of the homeowners. Second is the space that you have to work with. Then there are drainage, water containment, mechanicals, fixtures, wall and floor tile, and ventilation. 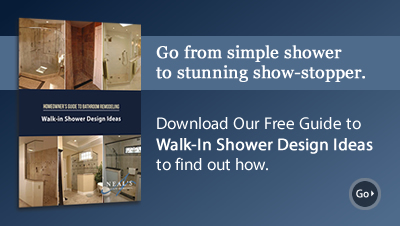 Since walk-in showers are mostly custom designs, you can get exactly what you want. 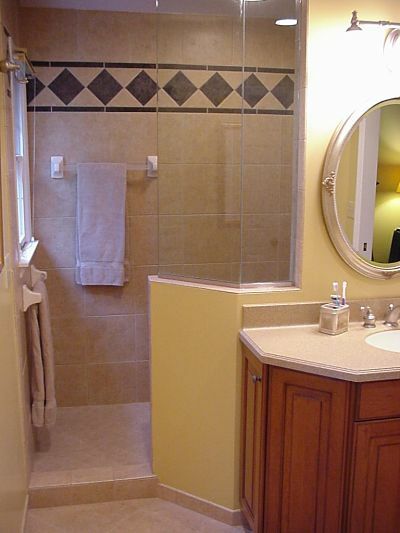 You don’t have to design your space to fit the shower stall. What are the options? Take a look at these awesome design ideas for walk-in showers without doors that we’ve completed for homeowners right here in Greater Cincinnati. Some homeowners want a unique and elegant look to their master bath. In this home we built a functional curved shower that also provides a splashguard for an adjacent tub. 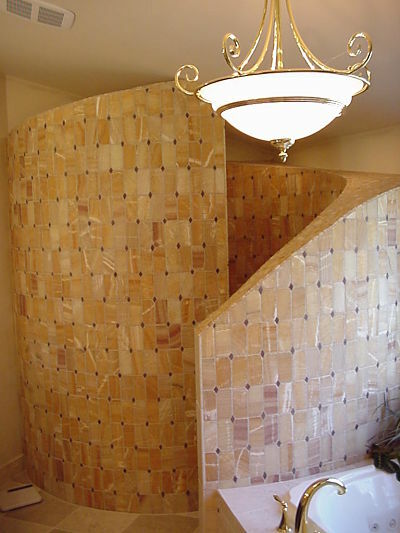 The curved shower wall provides an architectural element and privacy. The design contains water and integrates the shower with a tub. The shower interior includes a bench seat, an adjustable handheld showerhead and slip-resistant flooring. 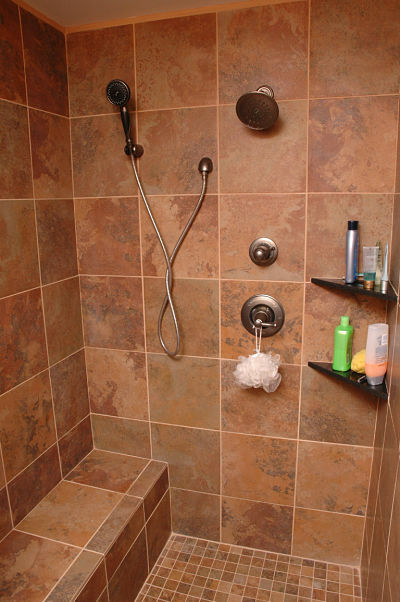 People often choose a walk-in shower without doors because it is easy to clean. Glass doors can be problematic when soap and residue build up and streaking occurs when cleaning. Easy care tile cleans by wiping and requires little maintenance. 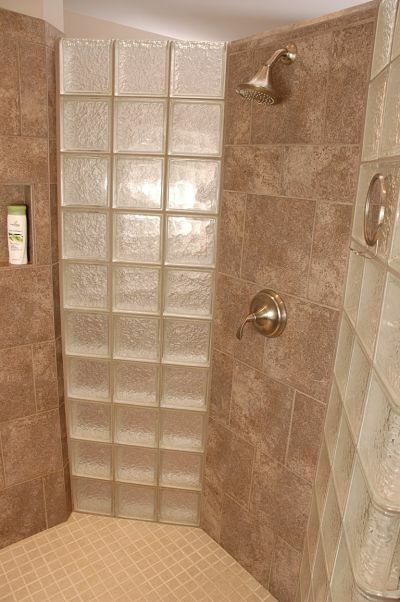 Larger tiles use less grout and clean up quickly. 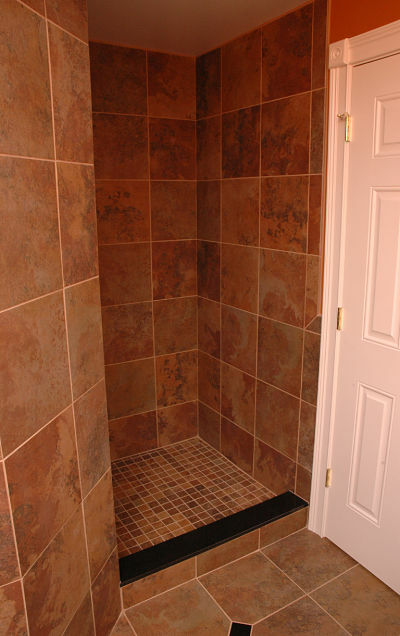 A simple design creates a doorless walk-in shower that is accessible and easy to maintain. Easy care 12-inch tiles were used for the walls and shower bench and quartz was used for the shelves. The flooring is slip-resistant tile. 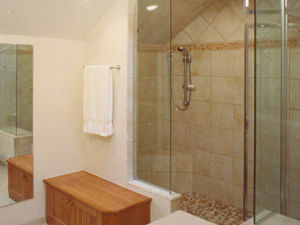 Glass is still the most common enclosure used for showers. Glass enclosures effectively contain water, allow light into the space and are attractive. One solution for enclosing walk-in showers is to use glass partitions or to combine glass with a half wall that provides privacy. 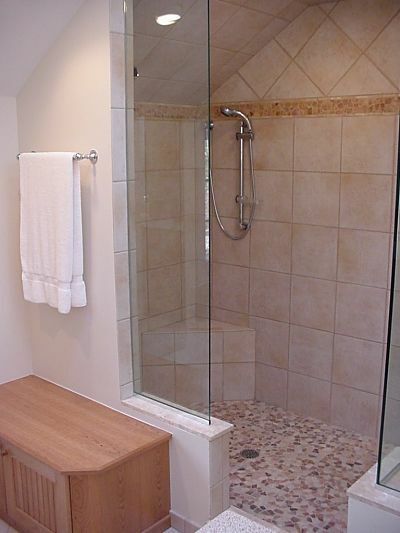 A knee wall and glass enclosure provide privacy and contain water in this walk-in shower design. A knee wall and glass enclosure provide both water retention and privacy in this walk-in shower without doors. Universal design features make a bathroom safer, more functional and improve accessibility for all users. Universal design features for walk-in showers include level or low thresholds, lever handle shower controls and faucets, slip-resistant flooring, grab bars, shower seats, handheld showerheads and good lighting. A doorless walk-in shower with a level entry threshold, grab bars, lowered shower controls, an adjustable handheld showerhead, wall mounted showerhead and slip-resistant flooring. Creating a spa at home is now possible with new steam bath products on the market. A walk-in shower without doors can be integrated with a steam bath to provide a place to rinse off and cool down. 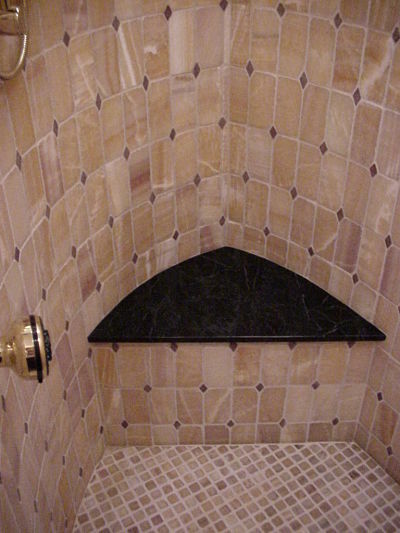 A walk-in shower without doors leads to an enclosed steam bath. A doorless walk-in shower and enclosed steam bath combination. Glass blocks add style and architecture to a bathroom but are also functional. 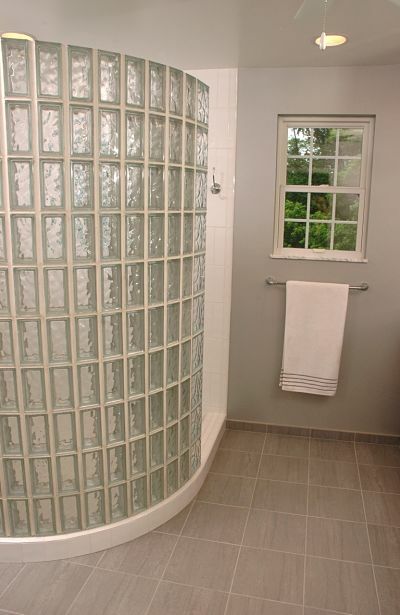 They provide privacy to a shower, let in light, retain water and are easy to clean. 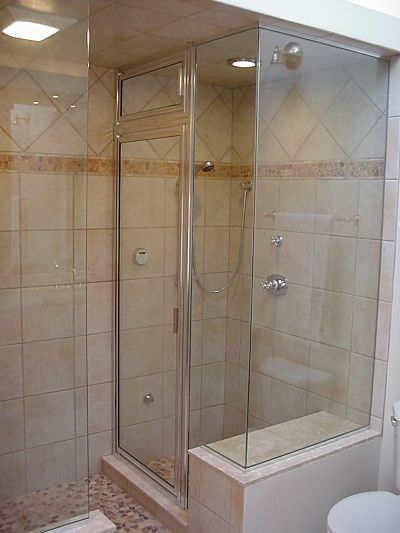 A partition wall used as a screen leads to a doorless walk-in shower. Tile frames the drywall and glass blocks. 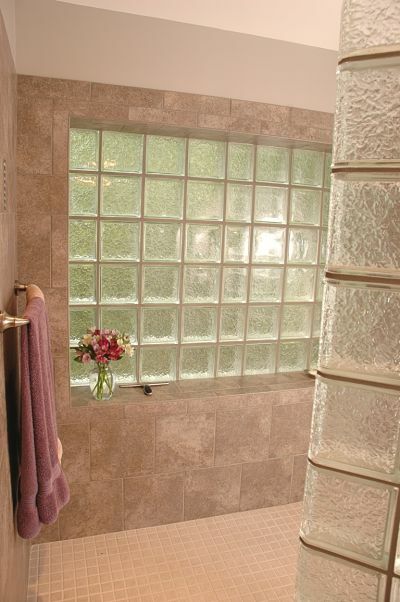 A window of glass blocks brings natural light into the shower and provides privacy. The interior of the shower includes a wall niche, wall-mounted showerhead and shaving mirror. 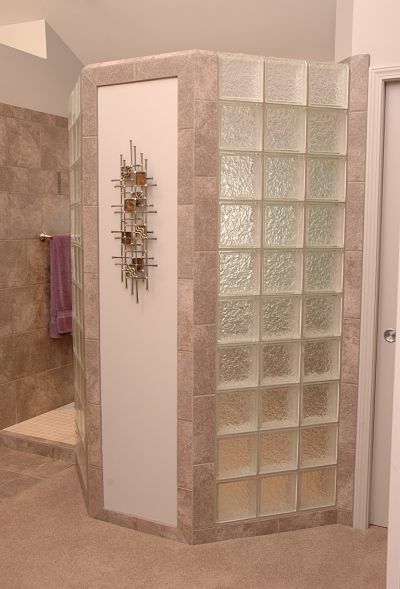 Glass blocks create a curved shower wall that retains water, lets in lights and provides privacy. 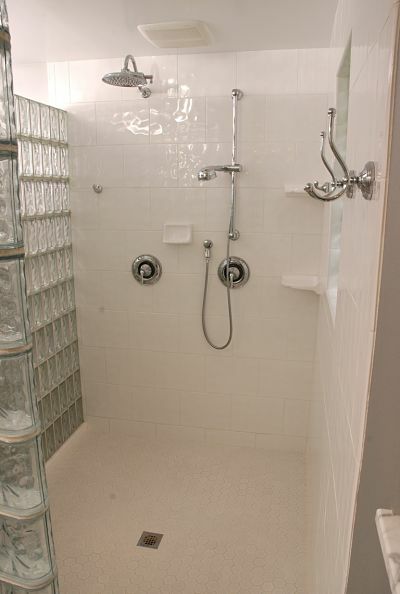 This interior of this shower includes white tile, a glass block window and dual showerheads.